Today, Lancôme has appointed some of the greatest contemporary perfumers to pay homage to Lancôme's founder, Armand Petitjean. 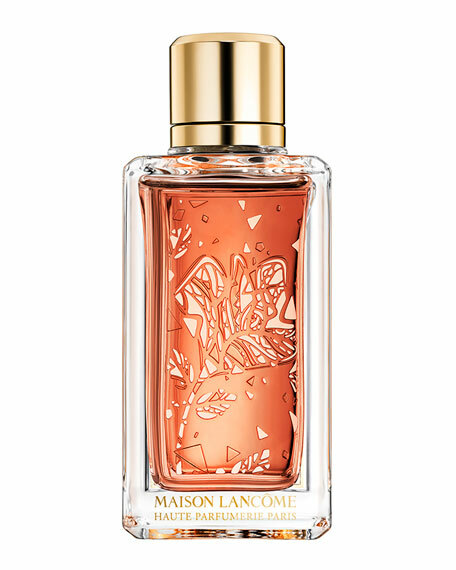 The result is Maison Lancôme, a new collection of fragrances that so exquisitely touch upon and carry on Petitjean's dream, and the essence of the House itself. This new High Perfumery experience takes a creative stance: the very French art of blending. Each fragrance is crafted in the same manner that one composes a wine of the most superior grade (Grand cru), with a combination of varieties, origins, and extractions that are all specially selected according to precise criteria. Nathalie Lorson has masterminded a stunning assemblage of two extractions of Rose Centifolia. The Rose Centifolia distillate gives the fragrance a natural, fruity floral freshness which evokes the scent of rose fields that wafts in the air around Grasse. As for the Rose in infusion, it reveals sweet, hazy, well-rounded notes, playing with the inflections of the distillate. This pairing is accentuated by wisps of heady incense and brightened up deliciously by essence of pink pepper. Invigorating, voluptuous, sensual. The Liqueur of Rose signature completes this delicate accord with a dusky veil woven with ciste labdanum, vanilla absolute and Tolu Balsam. Heady and sensual, this fruity floriental wraps us in a gourmand veil of irresistible sweetness. With a precious bottle made of glass and gold, the noble materials reveal the story of the Art of Assemblage. Lancôme revisits its tradition of uniting art and craftsmanship by entrusting French artists Alex & Marine to tell the story of the Grand Cru Fragrances with each unique bottle design. Drawing inspiration from the fragrance florals, including the way that they were picked and crafted into an essence, each fragrance blend is interpreted with an illustration that has been reproduced on a golden plate on the back of the bottle, like the fingerprint of each raw material. The plate acts as the transparent window of the glass bottle, emotionally and gracefully expressing the reinvention of the Flower.